The outer surfaces of leaves and petals are covered in a protective polymer – cutin – that is the plant’s main interface with the air. Prof. Aharoni and his colleagues discovered that when an enzyme called Defective in Cuticular Ridges (DCR) is silenced, spaghetti-like structures on the petals’ surface – cuticular ridges (seen in the left-hand images) – did not appear (right-hand images). Images were obtained by scanning electron microscopy. The warping of the accretion disk by the stars changes the average orientation of the disk in a random way (blue point, its trajectory the light blue line). This affects the spin axis of the massive black hole in the center by the frame-dragging effect of Einstein's theory of general relativity. As a result, the spin axis of the black hole tries to "catch up" with the orientation of the disk (red point, trajectory traced by the magenta line). Prof. Alexander and his colleagues showed this cosmic game of "tag" may explain why strong radio jets emitted by massive black holes into the empty space between galaxies along their spin axes are sometimes observed to have kinks and bends. In the course of evolution, different traits undergo optimization that ultimately determines the chances of survival. A single trait, such as beak shape, head width or body mass, may be best suited to performing one task, but not another. Prof. Alon and his colleagues looked at the trade-off that natural selection imposes between multiple traits, each of which is best suited to a particular task. These trade-offs, represented here by the light-blue shaded triangles, were found to obey the Pareto front concept, which describes the most efficient allocation of resources in economics and engineering. Prof. Amit and his colleagues are developing methods to understand the single cell within its natural context of cells, tissue, organ and organism. 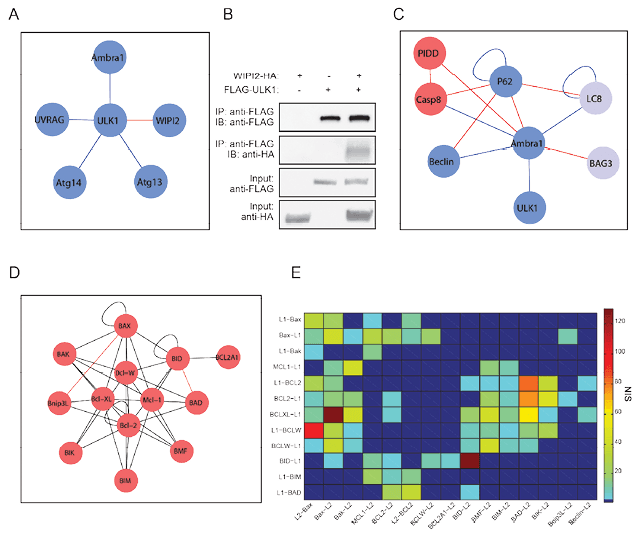 These methods, in which the RNA in thousands of cells is sequenced in parallel, reveal the heterogeneity and underlying biology in various immune niches of supposedly identical cells and the relationships between cells. The images reveal a pyramid of differentiated cells with a stem cell at its apex and the information flow (from single cells). The sperm, originally clumped in bundles, are split apart from the head to the tail by the passage of the individualization complex (bright yellow). The motion of this molecular machine is made possible by caspases, the executioner enzymes of the cell death program, which help to break down the cytoskeleton holding the sperm cells together. Prof. Arama and his colleagues have discovered the mechanism that keeps the caspases in check. It includes the A-S-beta protein (green) on the surface of energy-producing organelles, the mitochondria, in the adult fruit fly. The A-S-beta activates ubiquitin complexes which, in turn, activate the caspases. Only those caspases that have come into physical contact with the ubiquitin complexes become activated. This mechanism ensures that the caspases are not activated all at once, which would kill the sperm or cause unwanted damage. At one point in the process of cell division, before it splits in two, the cell has double the amount of genes. Since replication is not synchronous, this doubling could lead to an imbalance in the expression of early vs. late expressing genes, with possibly deleterious consequences. Prof. Barkai and her colleagues discovered that in budding yeast a chemical tag deposited on replicated DNA helps prevent their activation. The graph shows this process over time: In yeast lacking the tag, messenger RNA peaks along with DNA synthesis. During the past decade, topological classification has revolutionized our conception of the properties of materials. 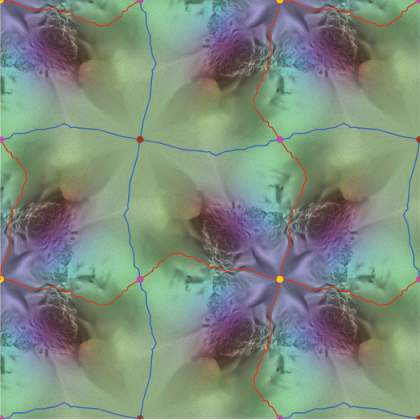 Topological materials host exotic electronic states on their surfaces. 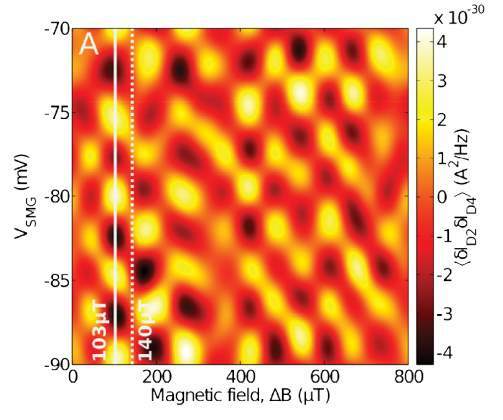 Dr. Beidenkopf and his colleagues have studied the surface of the topological Weyl semimetal tantalum arsenide using scanning tunneling microscopy. Among various trivial surface states, the scientists visualized and characterized the unique properties of the topological Fermi-arc states. 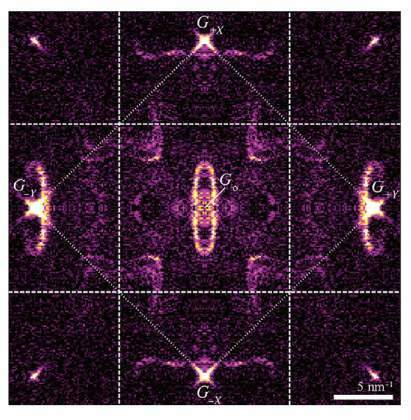 The researchers achieved this visualization through the interference patterns of quasiparticles (purple and white) that scattered electrons embed. 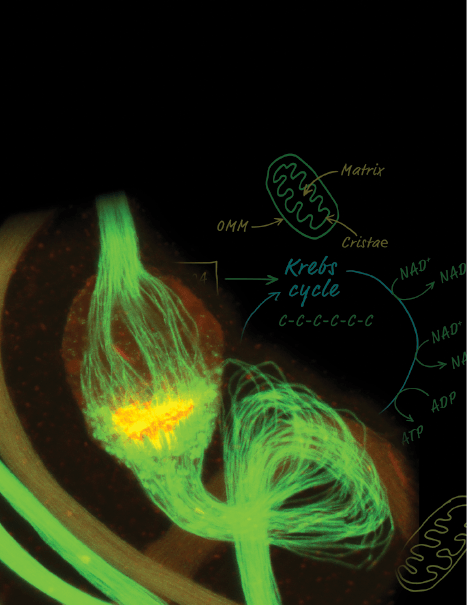 Stress regulation and energy balance share common neuronal circuits in the hypothalamus. Prof. Chen and his colleagues have shown that a receptor for the protein called corticotropinreleasing factor, or CRF, acts as a gatekeeper: It makes sure that the brain neurons make optimal use of available energy resources at times of stress, for example, during fasting or exposure to cold. 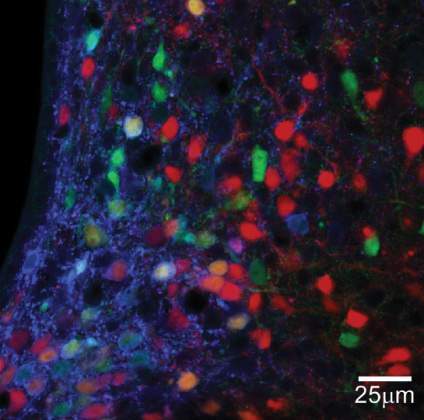 In this sample of a mouse brain, the neurons expressing the CRF receptor are marked in green. Resilient encoding proofs are highly useful for cloud computing. Prof. Dinur and her colleagues described the encoding of proofs ( PCPs) that are very resilient. 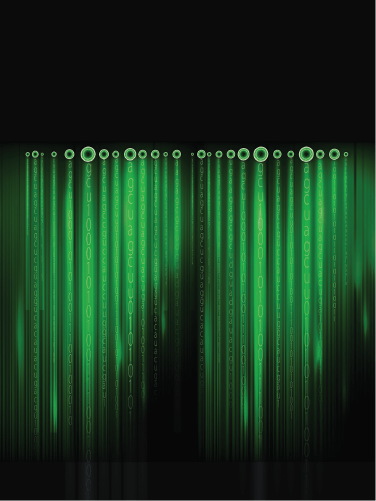 These proofs are probabilistically checkable by looking at a constant number of locations; for example, when performing a complex bank transaction on a cell phone, the server may check its integrity relatively quickly using a PCP. 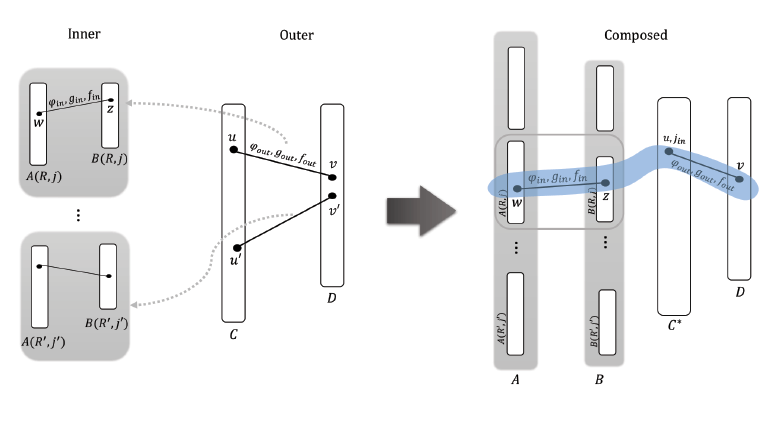 A key idea is to break a proof to pieces in a redundant way and then use a recursive encoding on each piece, as shown in the figure. Imaging of very small objects as nanocrystals, viruses or single molecules is a challenge in many research fields. Obtaining very high resolution images in optical imaging is limited by the wavelength of light, while x-ray maging presents challenges in the reconstruction of the structure from the scattering of the rays. Prof. Dudovich, working with Profs. Dan Oron and Boaz Nadler attained a breakthrough that enables one to reconstruct an object’s shape from a single photo. Up to 80 percent of overweight people suffer from “relapsing” or “yo-yo” obesity: After successful dieting, their weight rebounds. Worse still, they usually regain more weight with each dieting cycle. Dr. Elinav and Prof. Eran Segal, together with colleagues, discovered that the gut microbiome plays an unexpectedly important role in exacerbated post-dieting weight gain, and that this common phenomenon may in the future be prevented or treated by altering the microbiome. 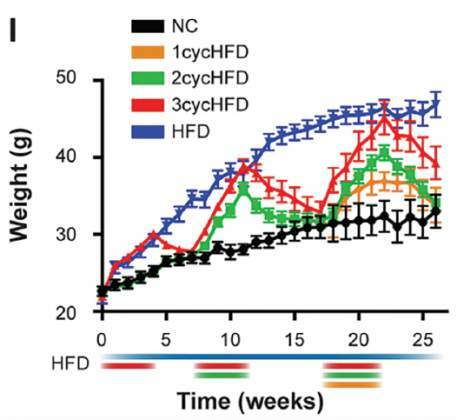 In the figure, the curves (from black to green) show the increased obesity of mice with each repeated dieting-weight regain cycle. 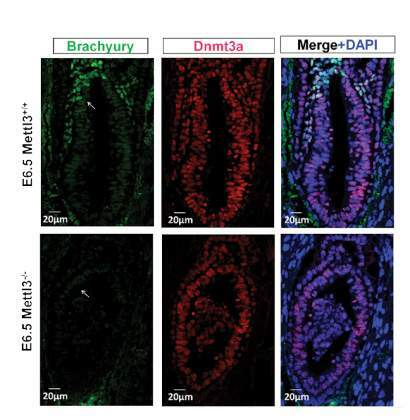 Dr. Erez and her colleagues discovered that an enzyme called Ass1, which plays a role in the body’s urea cycle, is downregulated in the intestines in villi when they proliferate. In the study, they found that this downregulation may also be used by cancer cells to proliferate. In the image, Ass1 appears in green dots in the intestine of a genetically engineered mouse. How does a cell know how large it is and how much more it needs to grow? 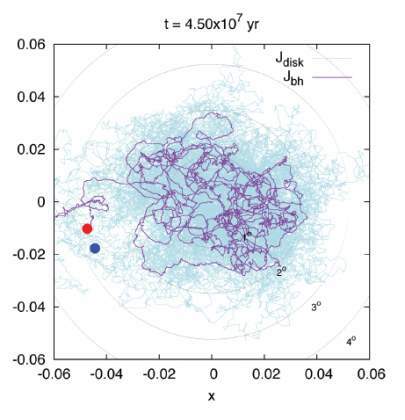 Prof. Fainzilber and his colleagues found a mechanism that helps large cell types “measure” their length and size with molecular motors that travel up and down microtubule structures. Their experiments showed that the mechanism requires a nuclear import factor that colocalizes with the motor (colocalization shown by the red dots). 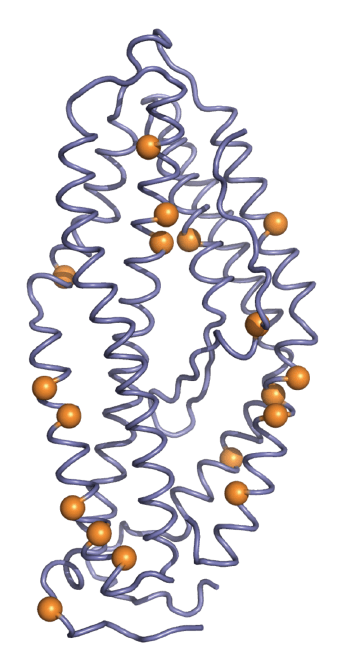 This snapshot from a dynamic model captures the three subunits of a protein called laminin (blue, gray and purple) as they wrap around one another to form the spine of the protein. Laminin is a fibrous protein that helps give structure to the extracellular matrix surrounding and supporting our cells. To create the dynamic model, Prof. Fass, Gad Armony and their colleagues introduced chemical cross-links (magenta and green) that revealed which parts of the structure are close to one another. Dr. Firstenberg and his colleagues are developing experiments in which photons – particles of light that do not normally interact – are coupled to atoms and thus interact strongly. The illustration depicts new phenomena that may arise from these experiments; for example, the crystallization of light. As well, it may lead to such applications as all-optical logic-gates for quantum networks. Proteins found on the outer surfaces of bacteria, viruses and parasites can serve as vaccines for preventing or blocking infection. But these proteins are often unstable, and their production is sometimes extremely costly. Using an algorithm they developed, Dr. Fleishman and his colleagues modified a protein from the surface of the malaria parasite. On its 3D structure, the modified spots are marked by orange spheres. The altered protein is resistant to heat and can be produced simply and cheaply. 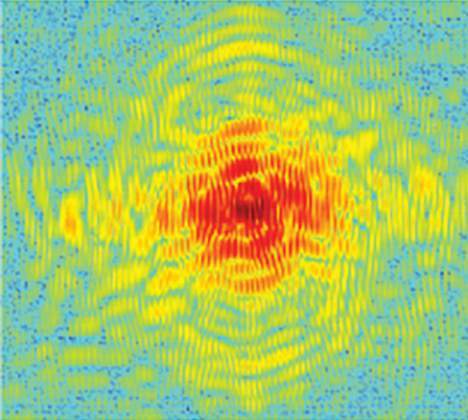 “Super signals” in metabolic MRI: Prof. Frydman and his colleagues rely on a method known as dissolution Dynamic Nuclear Polarization (dDNP), in which a cryogenic pellet containing a chemical of interest is hyperpolarized and then injected at room temperature into a body to monitor cancer and other physiological processes. 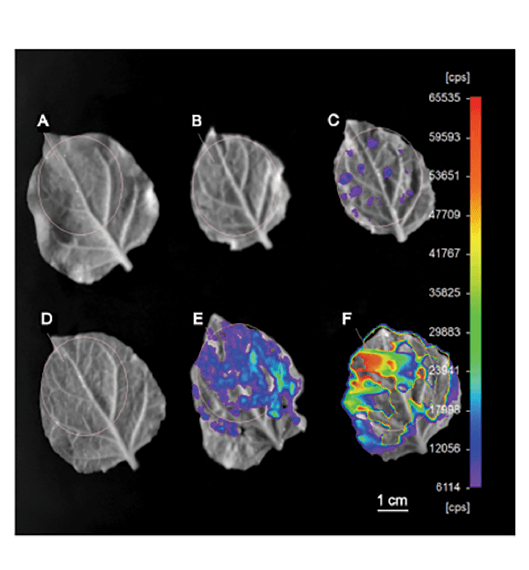 Ultrafast spectroscopic imaging methods, known by the acronym SPEN, developed in his group, then provide the high resolution 3D MR images of the metabolic products in the sub-second timescales needed to characterize the processes. In the image, the method is used on a mouse liver and kidneys. Ultrafast MRI in combination with dDNP could become a minimally invasive way to monitor cancer treatments and other metabolic changes in the body. An exploding star detected in a nearby galaxy just three hours into the process provided Prof. Gal-Yam and his colleagues working with the Palomar Transient Factory a unique opportunity for studying how supernovae form. 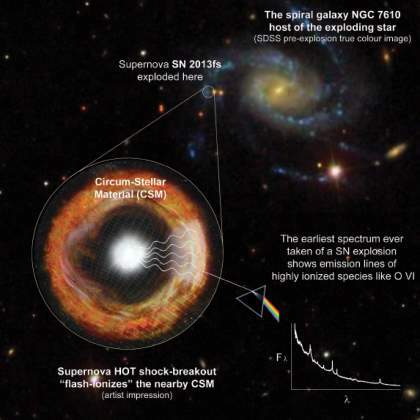 The Keck Telescope in Hawaii provided the optical spectra of the material thrown into space, which told the story of a star that was already unstable at least a year prior to the big explosion, and this yielded new clues to the steps leading up to the formation of core-collapse supernovae. Which protein complexes go into creating the focal adhesions that cells use to anchor themselves, move around and “feel” their environment? With multidisciplinary approaches including biochemistry, native mass spectrometry and cell biology, Prof. Geiger and his colleagues identified a new class of hybrid protein complexes comprising subunits involved in formation of actin filaments and adhesion components. 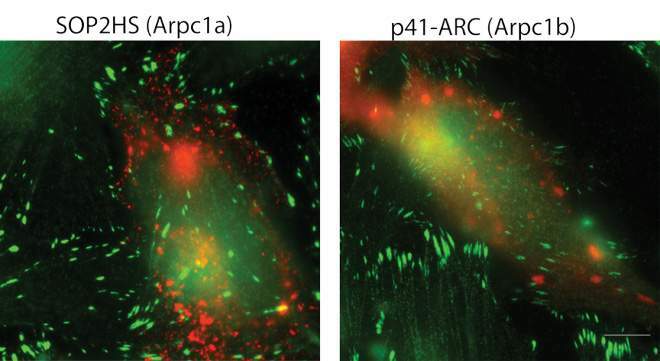 The image shows that when one component, Arpc1b (in red), that is involved in cytoskeleton assembly is over-expressed in cells, it interferes with focal adhesion formation (green). (Scale bar is 10 μm). The degenerate Whittaker models in the work of Dr. Gourevitch and his colleagues are closely related to Fourier coefficients of automorphic forms used in analytic number theory and string theory. These in turn are generalizations of the classical Fourier series. Since their introduction two centuries ago, Fourier series have had a tremendous number of applications in mathematics and physics. The formula depicted above describes a connection between the degenerate Whittaker models and another important notion in representation theory of real reductive groups: wave-front set of representation. Microbes that live where oxygen is in short supply, for example, under the ocean floor, “breathe” sulfur, and these play an important role in the planet’s carbon cycle. 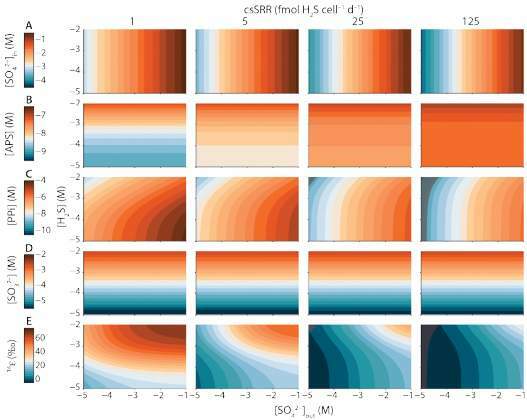 In this figure, Dr. Halevy and his colleagues developed models to predict the concentrations of various chemicals within the cells of such microbes and relate the growth conditions of these microbes to their preference for the light isotope of sulfur. How do embryonic stem cells know how and when to stop being stem cells and start differentiating? Dr. Hanna and his colleagues have identified a molecule they named Mettl3 that works on the messenger RNA, silencing strands that promote the embryonic stem cell state. Mouse embryos lacking Mettl3 did not completely shut down their “stemness,” and were only partially able to differentiate. When one measures the trajectory of a quantum particle, the particle behaves as a classical particle. This process is called dephasing via “which-path” detection. 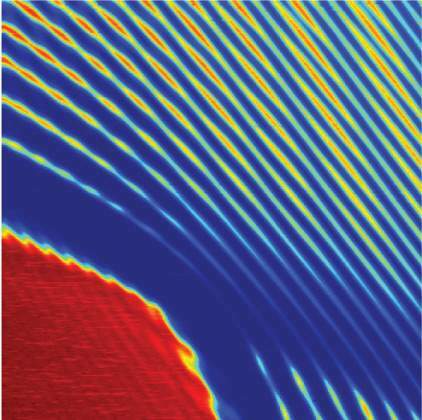 For the particle to regain its lost quantum behavior, the information gained in the “which-path” detection must be “erased.” The image, obtained by Prof. Heiblum and his colleagues, shows the results of applying quantum erasing in a mesoscopic electronic device. The white vertical line crosses the interference pattern (bright and dark regions) of a recovered quantum behavior, while the nearby dotted white line crosses a region of a dephased (classical) system. Red blood cells viewed under the electron microscope reveal that the activity of a unique RNA gene, microRNA-142, is required to maintain their familiar “biconcave” shape. 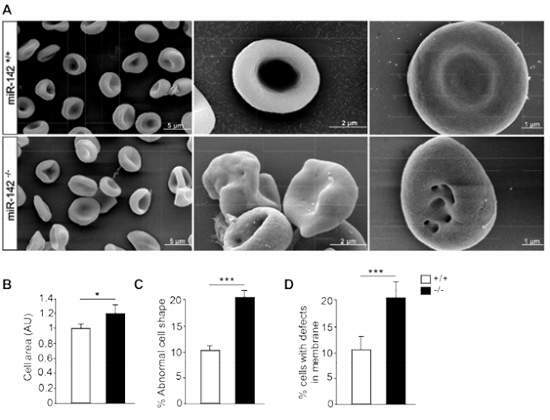 Prof. Hornstein and his colleagues found that when microRNA-142 was lacking (bottom), the red blood cells were misshapen and dysfunctional. An emerging conclusion from the work in Hornstein’s group is that miRNAs are essential to maintain normal cellular function and physiology. The smallest nanoelectronics, which will be measured in single electrons, will require extreme precision. Prof. Ilani and his colleagues have developed a method of producing ultra-pure carbon nanotubes in which they can control the movements of individual electrons. 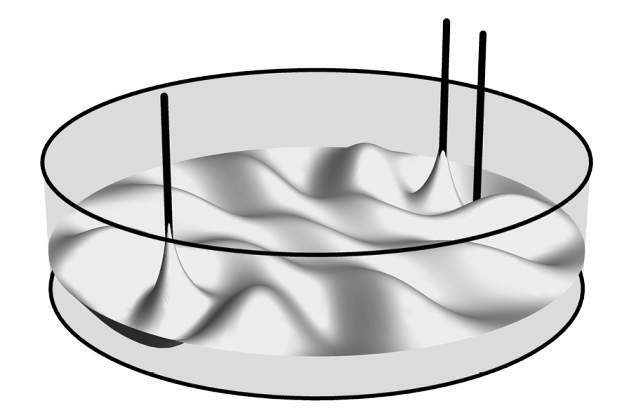 The image tracks the passage of electrons through a nanotube which is moved and in which the current is altered, revealing the possibility of complete control over the process. 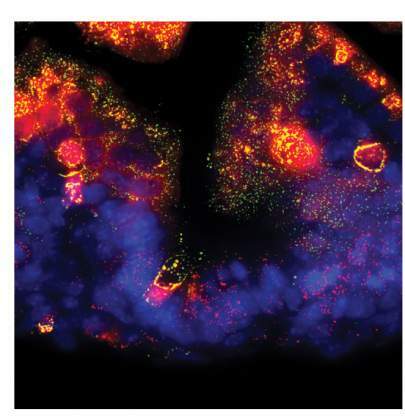 Imaging of individual mRNAs (red dots) in intact liver tissue reveals a clear gradient in the expression of the Pck1 gene, a key gene involved in glucose processing. In research performed by Dr. Itzkovitz and his colleagues, these genes are highly expressed within the periportal zone (PP) of the liver lobules. 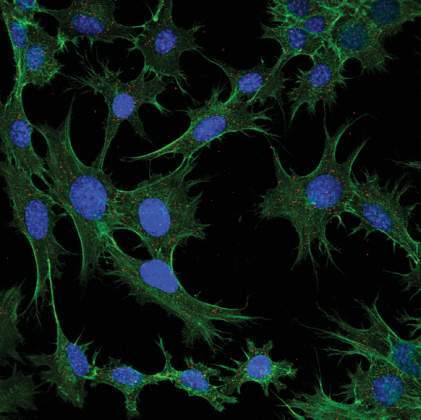 Green shows cell membranes; blue, DAPI stained nuclei. (Scale bar – 30um). 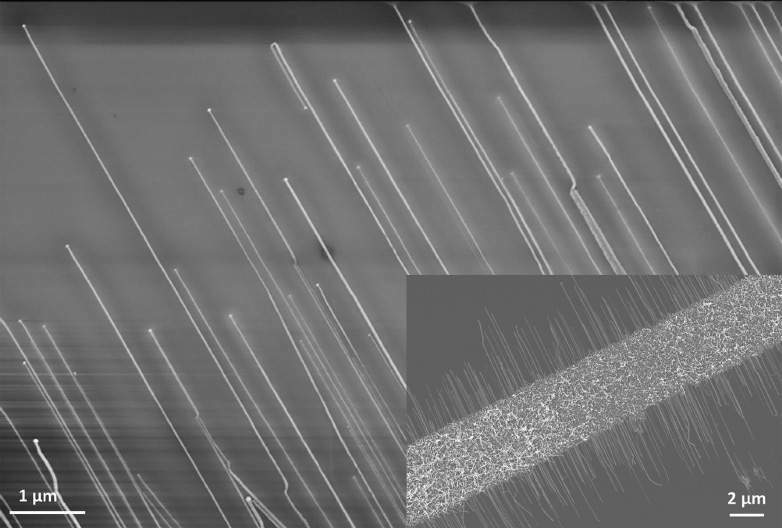 Scanning electron microscope images of nanowires made of gallium nitride (GaN) that grow horizontally on quartz, created by Prof. Joselevich and his colleagues. The crystal structure of quartz directs the nanowire growth, and etching enables the nanowire structures to be transferred to another substrate with their orderly structure intact. Prof. Jung and his colleagues investigate the contributions of certain immune cells – monocytes and tissue-resident mononuclear phagocytes – to the maintenance of health and the handling of such challenges as inflammation and infection. In this specific experiment they explored the regulation of microglia – macrophages in the brain that are mostly quiescent, but which play a role in inflammation. Using genetically-engineered mice, they investigated the function of regulatory microRNAs at different stages, finding that these limit the inflammatory response, and that their performance may drop over time. 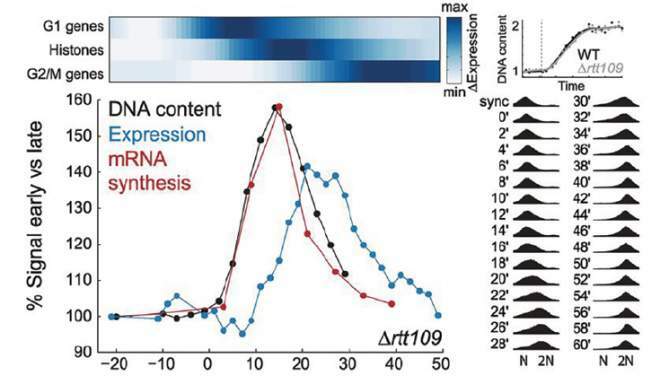 The figure reveals gene expression in these mice when exposed to a toxin (blue low expression, red high). 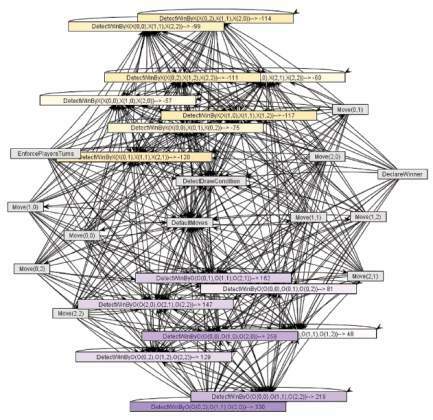 Life is networks of proteins interacting with each other. Prof. Kimchi and her colleagues developed a platform in which proteins that go together give off “sparks” of luminescence. The figures show sets of protein interactions whose outcome can spell life or death for the cell. In the images, a nanoparticle aggregate “explodes,” releasing molecules trapped inside. Such aggregates, assembled from unique nanoparticles by Prof. Klajn and his colleagues upon exposure to light, become “nanoflasks” in which chemical reactions take place at unexpectedly rapid rates. Such nanoflasks could improve both the rate and the selectivity of chemical reactions. Imagine a globe partitioned north-to-south with a large, but finite, number of lines. The resulting slices will be two dimensional and thicker in the middle than either end. This is a manifestation of the curvature of the sphere. Prof. Klartag and his colleagues discovered that a similar partition may be obtained for any curved surface in two dimensions, three dimensions or even more, and they showed how such partitions explain the isoperimetric inequality in curved spaces. Biological lubrication, for example, of our knees and hips, must last for years under continuous stress and slippage. Its secret may be adding a bit of water: Prof. Klein and his colleagues reveal how systems in which double layers of liposomes (shown in blue) slide past one another easily, due to highly hydrated head groups. Such liposomes are believed to reduce friction in living joints; understanding how the body reduces friction may lead to better treatments for osteoarthritis. 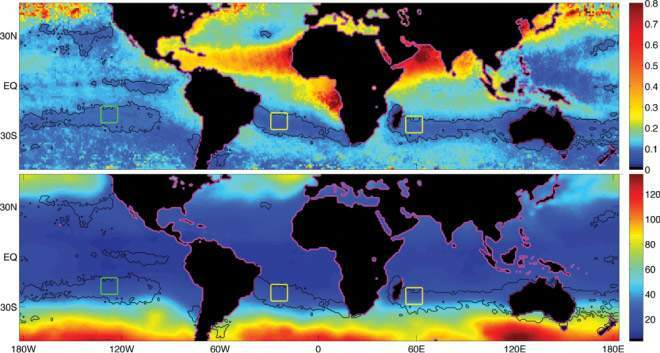 Satellite images from NASA show aerosol optical depth (AOD), a measure of liquid or solid particles suspended in the atmosphere, over several months in 2007. The rectangles mark pristine areas in which the levels of aerosols emitted into the atmosphere are lowest. 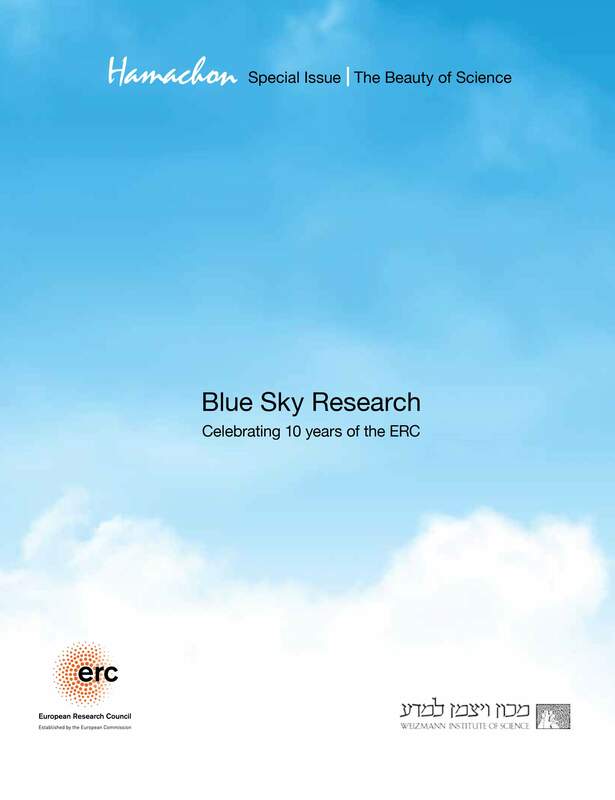 Prof. Koren and his colleagues investigated the physical processes at work in the formation of "aerosol-limited clouds” in these regions, offering an explanation to observations showing invigorated clouds in polluted environments. Research by Dr. Krizhanovsky and his colleagues reveals the interaction of a senescent cell (green) with other cells. 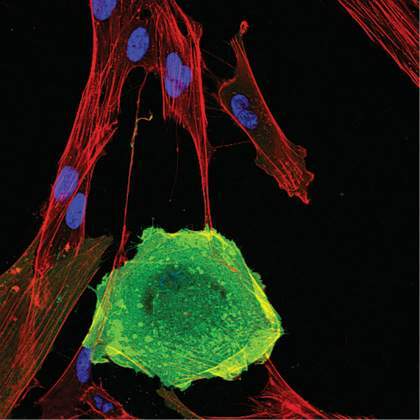 Cytoskeletal elements are stained in red in both cell types. Senescent cells – cells that have not died but don’t proliferate – play roles in both tumor suppression and aging. Here, senescent cells “reach out” to other cells by forming tiny tubes that connect the cell membranes. 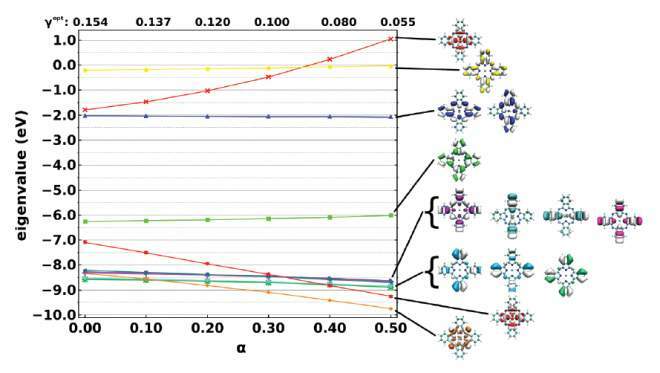 Prof. Kronik and his colleagues developed new methods for accurate prediction of the electronic structure of molecules and materials from first principles. The approach – which they call optimal tuning – has been developed within the framework of the well-known density functional theory. In the image, different electron orbitals of the copper phthalocyanine molecule (depicted right) are plotted according to their predicted energy levels, given as a function of numerical parameters. Optical instruments, for example, light microscopes, are limited by the wavelength of light. 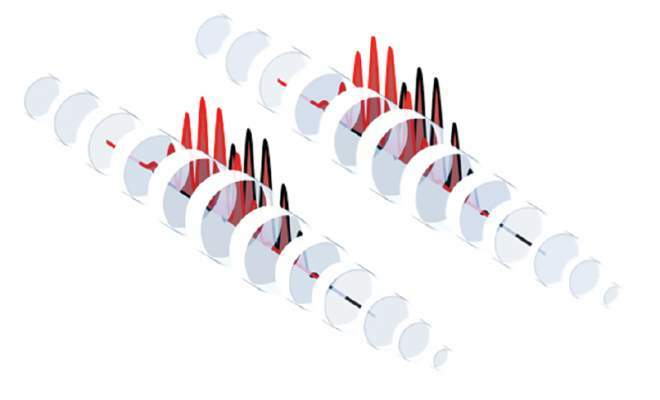 An instrument called an absolute optical instrument, illustrated here in a study by Prof. Leonhardt and his colleagues, might inject the waves at one source and have them perfectly focused at the correct image position, granting, in theory, unlimited resolution. Genome editing requires the ability to cut the DNA in the correct place and insert the wanted sequence. Prof. Levy and his colleagues conducted a comparative analysis of different nucleases – gene cleavers – by inserting the Luciferase gene into tobacco leaves. The success of the insertion was revealed in luminescence imaging. Pictured here are negative controls A, B and D; Talen nuclease C; zinc finger nuclease E; and a positive control, F. As often happens in science, these methods have been supplanted, in this case by the CRISPR-Cas nuclease, which was assessed by Levy and his group in 2015. Prof. Lipman and Noam Aigerman developed a method for mapping surfaces in three dimensions onto a two dimensional plane while preserving the geometric properties of the surface and respecting the symmetry of the plane. The image depicts tiling of the plane with a flat version of a three dimensional scan of the face of Michelangelo’s David. GlycoTracker\ Tracking glycosylations with targeted, molecule-sized "noses"
One of the characteristic signs of Alzheimer’s disease is the formation of amyloid-beta plaques in the brain. 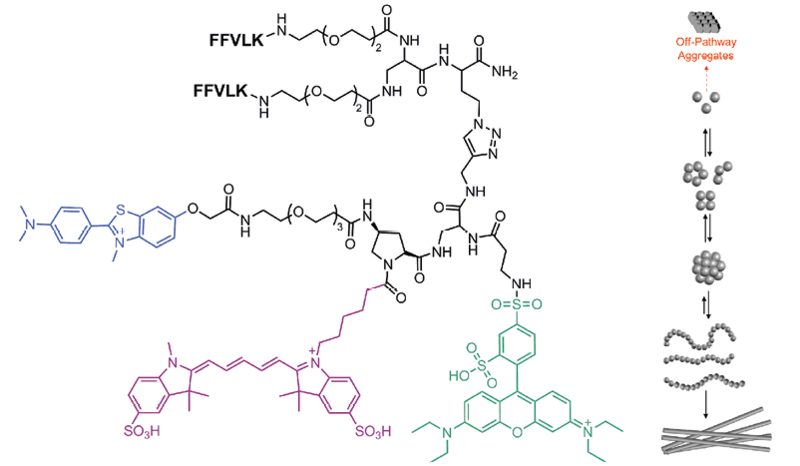 Dr. Margulies and his colleagues developed a synthetic molecule that acts as a tiny sensor that can track the formation of such plaques with fluorescent signals. Newly formed proteins tend to undergo further modifications before they perform their assigned tasks. 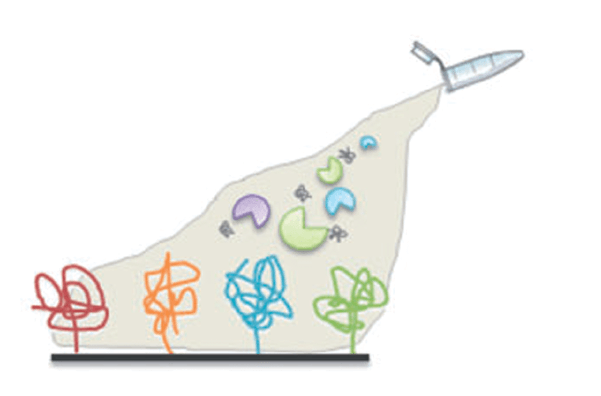 Post-translational modification (PTM) profiling monitors these changes in thousands of proteins within their biological context to reveal global patterns of regulation and fundamental cellular processes. PTM profiling was used here by Dr. Merbl and her colleagues to understand how ubiquitin and ubiquitin-like molecules create an abnormal protein modification pattern in cancer.